Mifare RC522 is the high integrated RFID card reader which works on non-contact 13.56mhz communication, is designed by NXP as a low power consumption, low cost and compact size read and write chip, is the best choice in the development of smart meters and portable hand-held devices. MF RC522 use the advanced modulation system, fully integrated at 13.56MHz with all kinds of postive non-contact communication protocols. Support 14443A compatible answer signal. DSP deal with ISO14443A frames and error correction. Futhermore, it also supports rapid CRYPTO1 encryption to validate Mifare series products. MFRC522 support Mifare series higher speed non-contact communication, duplex communication speed up to 424 kb/s. 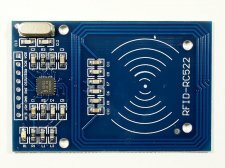 As a new family member in 13.56MHz RFID family, MF RC522 has many similarities to MF RC5200 and MF RC530, and also has more new features. This module can fit directly in hand held devices for mass production. Module use 3.3V power supply, and can communicate directly with any CPU board by connecting through SPI protocol, which ensure reliable work, high reading distance.